Since 1960, more than 100,000 Austrian soldiers participated in peace support operations. Cold War is history, but many nations are still not at peace. Regional wars and armed conflicts continue and cause civilian casualties, too. The ratio between civilian and military fatalities is generally nine to one. Peace Support and Peace-keeping are important tasks of the international community, today. In addition to the United Nations also regional organizations, such as OSCE, EU, and NATO are involved in the Service of Peace. In this, they are setting political, diplomatic, and economic initiatives and measures. Failing this, military means may be used. As a	member nation of many international organisations, Austria is contributing to joint international peace keeping effort. 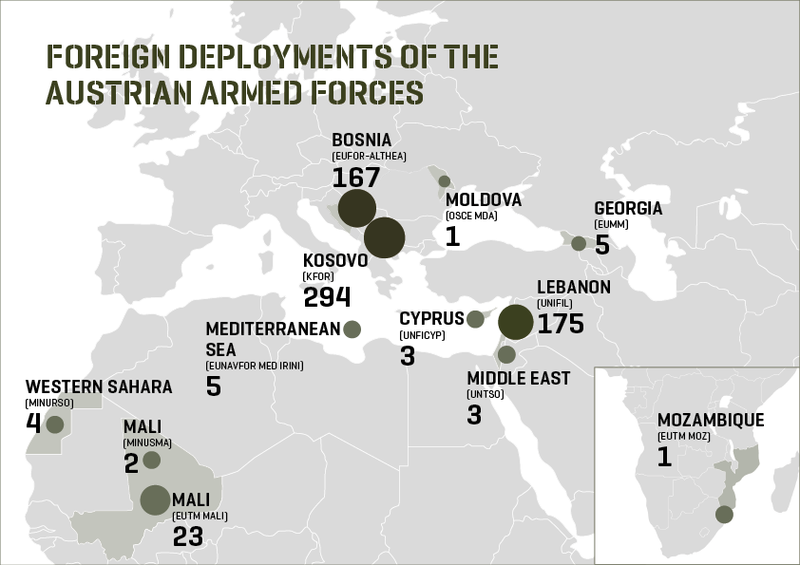 Since 1960, more than 100,000 Austrian troops and civilian helpers have been participating in more than 50 international peace support and humanitarian missions. Since the end of the Cold War the number of missions has been growing rapidly. In addition to classical peace-keeping or peace support operations there is now a growing number of humanitarian and disaster relief operations to be taken care of. Since 1989, which marked the end of the east-west conflict, the number of peace support operations has been growing rapidly. In 1992, the UN Secretary-General initiated the Stand-by Arrangement System under the "Agenda for Peace" to meet growing costs for the ever increasing number of missions. Meanwhile, this system has been adopted for peace support and humanitarian operations run by other international organizations. Austria reacted to the Stand-by Initiative of the international community by organizing prepared units, which, not being standing units, are similarly organized to reserve units. They can be deployed rapidly and for various periods of time as required. If needed, contingents for service abroad will be formed from modular structured units and subunits, then trained and dispatched. Some prepared units are designed for rapid deployment. In the short period of preparation the units undergo a specific training with regard to the area of operation.